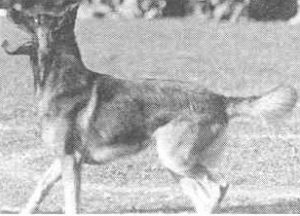 Rudie Pegge is owned by the well known Dutch KNPV competitor and breeder Hans Pegge. We have imported Offspring from Rudie and they will be used in our breeding program. Rudie is considered one of the best up and coming KNPV trial dogs in Holland today. 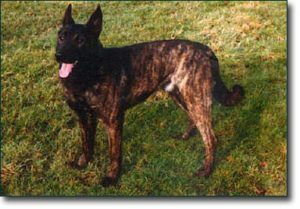 At the 2003 National stud dog trials in Holland, Rudie out scored the 2003 KNPV 2 National Champion Kazan Beck (another Dutch Shepherd). 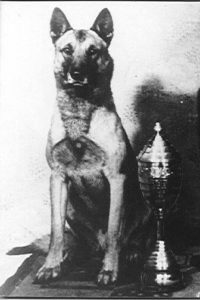 Kazan was also the National KNPV 1 Champion. Rudie passed his KNPV 1 title with the score of 425 Met Lof and his KNPV 2 title with full points of 455 Met Lof. Rudie’s half brother is the 2002 PH 2 National Champion Nico van Neerland. Rudie also passed his Object title with the full 356 points. Rudie and Hans Pegge competed at the 2004 KNPV Object Guard Championships where they came second. Rudie is an extremely high drive dog with a very strong will to work. He is handler hard but not handler aggressive. 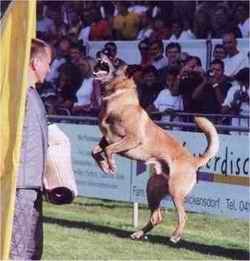 Rudie is also what the Dutch call a “Flyer”, making him a very exciting dog to watch in the courage tests. Rudie is also considered by many to be a stud dog of the highest quality, having been bred over 100 times already. Rudie and Hans Pegge have qualified for the 2006 KNPV PH2 Championships with the score of 454 Met Lof where he finished third. 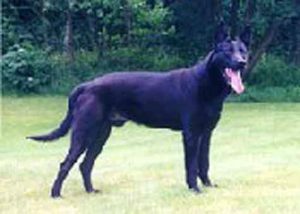 His son Tim II Groothuys KNPV PH1 Met Lof won the 2006 PH1 Championships. Tommy is owned by Rob Luijken in Holland. We have imported offspring from Tommy to use in our breeding program. Tommy is a very large dog at 68cms with a head most German Shepherds would be proud of. 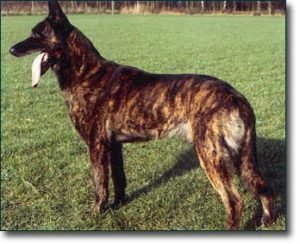 He is a dark brindle dog with strong bones. 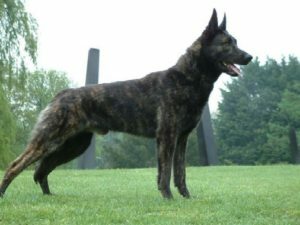 Tommy is one of the hardest Dutch Shepherds in Holland and is known for his extreme and intense bite work. He has crunching full bites and immense courage. Tommy is also a very handler hard and dominant dog who needs a very experienced handler. 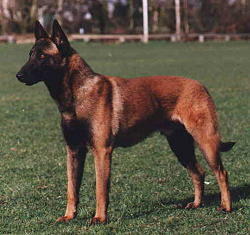 Tommy came from a very successful breeding which produced working dogs of highest standard. 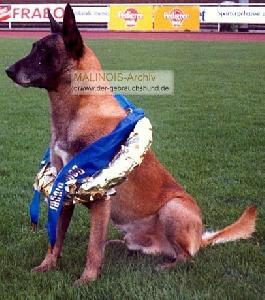 His brother Dickie van Nimwegen PH1 417 Met Lof, Object 339 Met Lof is considered a strong dog and his other brother Robbie van Eerden PH1 Met Lof, Object Met Lof competed at the 2004 Object Guard Nationals where he finished 3rd behind Rudie Pegge. Robbie is now an active police dog in the region of Kennemerland. 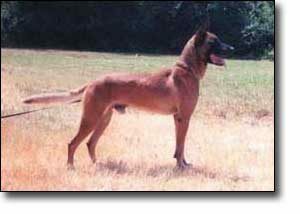 Tommy is a widely used stud dog and is known for producing offspring that have strong aggression and drives. There are many of his children that are doing well in the KNPV. To date he has been bred over 100 times. 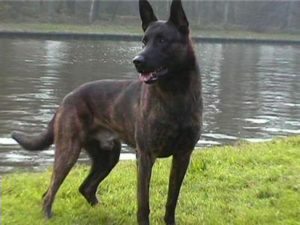 Arko is considered to be one of the top producing stud dogs for the KNPV program in Holland. 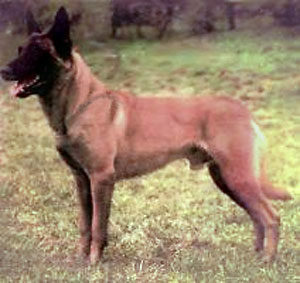 Arko has drive, power, and courage like we have never seen in any dog and he passes these traits on to his offspring with amazing consistency. 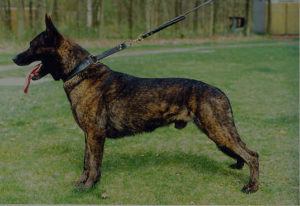 ARKO – KNPV PH1 Met Lof considered to be one of the top producing stud dogs for the KNPV program in Holland. 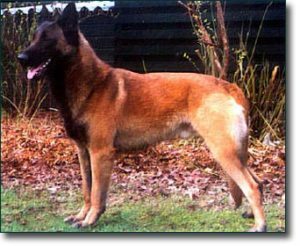 Arko has drive, power, and courage like we have never seen in any dog and he passes these traits on to his offspring with amazing consistency. Arko has perfect hips, back and elbows. He has a very dominant temperament, with natural aggression and is a very serious dog on and off the field. His frontal attacks are the fastest and most hardest that you could imagine, his grips are punishing to the decoy, and his fight drive is extreme. He has won every hard hitting contest he has ever competed in, in the USA and in Holland! 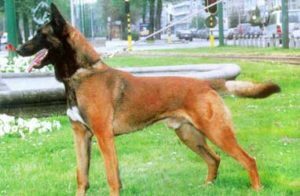 He also served as a working security dog in Holland where he hospitalized many suspects. He has an outstanding KNPV pedigree.